Join Sash and Stripes on the new Tiger Trail in 2019. Follow the Tiger Trail as it takes you through the season where you can collect stamps (and enjoy fun activities) for attending Richmond home games and bonus stamps for visiting the Tigerland Superstore, Before the Pounce or Open Training throughout the season. 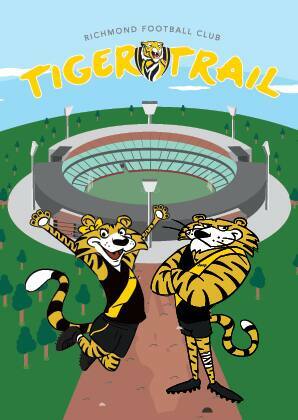 Collect your Tiger Trail map at our Round 2 game against Collingwood at the MCG and get your first game stamp at the Tiger Trail locations around the MCG concourse. Look out for the yellow Tiger Trail tear drop banners on game day. Collect as many stamps as you can throughout the season from the Tiger Trail team who will be at all Punt Road open trainings, Before the Pounce events and in the Tigerland Superstore.